Strives to put cinematic storytelling first and video game representation second, but still comes across as tropey and borrows heavily from Indiana Jones and the Raiders of the Lost Ark and The Last Crusade. However, in all fairness, it does provide this generation with a moderately good action-adventure film based on a best-selling video game series. Alicia Vikander’s Lara Croft differs from that of Angelina Jolie’s in that she comes across to audiences as someone who’s impulsive, reckless, and experiencing difficulty in managing her life. Furthermore, she does not excel at everything she is trying to do to survive life and make ends meat. Those qualities give this Lara Croft a level of humanity that allows her to connect more with audiences. Moreover, she is a believable character–she feels real. In fact, that is probably the best element that this reboot has going for it–the realness of the adventure. Not that the film is without exaggerations and fantasy elements; but, the story almost feels like an adventure that could take place under the right circumstances and with the right tools. The realness might have been increased by not feeling like, at times, you were sitting there playing the video game version. Although this initial return to the video game turned motion picture adaptation is frocked with predictable plot beats and turning points, it does show promise for a solid franchise if tweaked. Moving forward, the stories need to be stronger, original, and leave room for SUBTEXT. Video games turned motion pictures aren’t anything new. From Super Mario Bros to Mortal Kombat to Resident Evil to this year’s Tomb Raider, there have been many attempts to adapt interactive media (video games) for scripted/narrative cinematic storytelling. Ultimately, it has proven to be nearly impossible to create a successful motion picture from a video game. In short, Hollywood simply cannot seem to crack the code for a movie adaptation of a video game. There has yet to be a video game to film adaptation that has even encroached upon the fresh threshold of Rotten Tomatoes. But why is that? Often, movie adaptations of video games fail because their is more emphasis placed upon video game brand representation than the art of cinematic storytelling. In its defense, 2018’s Tomb Raider shows an effort to overcome that obstacle. Today’s Tomb Raider made a solid effort to spend time worrying about it’s quality as a film, but still fell victim to being too grounded in its interactive media roots. If studios who either own or license a video game intellectual property (IP) can spend time analyzing the source material for purposes of tapping into what makes the story itself work, then perhaps a successful video game movie can be produced. Not just limited to interactive media –>film adaptations, but anytime there is a well-established franchise, the writers and director struggle to find where the happy medium is in satisfying the core of the fan base and translating the story between two forms of media. As much as modern interactive media has in common with films (referring to the cut scenes), there is still the human component that cannot be translated for the screen because there is no “choose your own adventure;” it’s this disconnect that often contributes to the poorly written plot for the screen. Much in the same way that movies based on comic books struggled for a long time until Iron Man, with the brilliant exceptions of Tim Burton’s Batman (a Barman movie directed by Burton) and Batman Returns (a Tim Burton movie that happens to have Batman characters), interactive media based movies will eventually find the sweet spot. I feel that this sweet spot will be found when writers and directors take the characters from a video game IP and place them in an original cinematic story that skews more towards the focus being on the cinematic storytelling than adhering to brand recognition and the existing story that can be played, and has been played, on the console or computer. Take Burton’s approach to Batman Returns. Create a story that works for the screen that happens to have the characters from the video game. Movies aren’t the only adaptations of interactive media; themed entertainment has also spent time adapting a game for an entire attraction. According to Theme Park Tourist (2014), popular seasonally operating Paramount’s Kings Island (purchased by Cedar Fair in 2007 and all Paramount property removed) spent $20MIL on a ride that lasted a mere five years. Based on the hit video game and blockbuster action movie Tomb Raider: The Ride was on par with Disney and Universal in respect to story, setting, and special audio/visual effects; however, after Paramount sold off its theme park investments to Cedar Fair, the ride got rebranded as The Crypt, a generic theme, and all direct associations with the movie and game Tomb Raider were removed following the 2007 operating year. Interestingly, the ride attendance continually dropped following the rebranding, and the ride was eventually moved to Kings Dominion in Virginia in 2012. Although there may be other reasons as to why the ride became less popular and eventually moved to another park, it is conceivable to conclude that there is a special relationship between the characters and story of the game and a themed entertainment attraction. Both the attraction and the game have the advantage of the human component–the ability to truly experience the elements of the game. Over all, I found the new Tomb Raider to be a fun watch! Certainly don’t feel that my time or money was wasted. I remember playing Tomb Raider on the original Playstation and Playstation II (it was soon after that, that I lost interest in gaming), and as a mild fan, I feel that this film did the characters and story justice. By the end of the movie, it is obvious that MGM’s intention is to attempt to produce a blockbuster franchise. And to the film’s credit, this first installment had a satisfying ending plus it quickly setup the next movie. 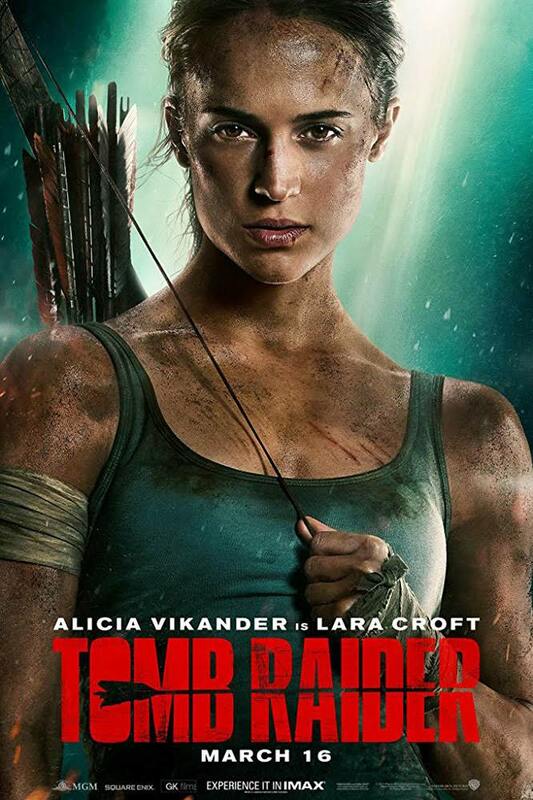 If you like action-adventure movies or even a fan of the video game series, I feel that you will enjoy Alicia Vikander as Lara Croft: Tomb Raider!